First pattern listed on Etsy! Well, today is a momentous day for LBDFxbg. 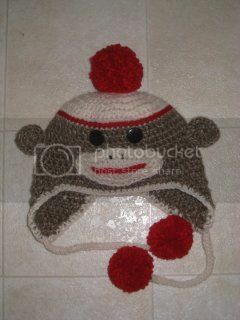 Over the past week I have been writing and typing up a pattern for the sock monkey hat I recently created for my husband’s aunt. She wanted to use it for skiing, so a slightly fuzzy, bulky yarn was called for. I loved working with the yarn I chose, which was Lion Brand Yarn Jiffy. So comfy and nice! 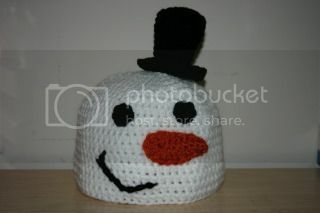 Here is the link to my shop on Etsy where the pattern is for sale! In the process of writing the pattern I realized how much actually goes into writing something as “simple” as a crochet pattern. Not only was it time consuming, but stressful! You have to get the wording right, get the correct angles for pictures and “package” it in a way that is not only pleasing but fluid too! I asked a very nice lady to read over my pattern and she did and gave just a few suggestions. To add a hyperlink here, a more detailed description there and to rearrange some wording over there. All in all, not too shabby for my “first” written pattern. I put first in quotation marks because I have short handed other patterns for myself, but this one was for public scrutiny so it had to be perfect! Thank you Tara at Mamachee*Crochet makes me happy! and EASY for your wonderful support and suggestions! 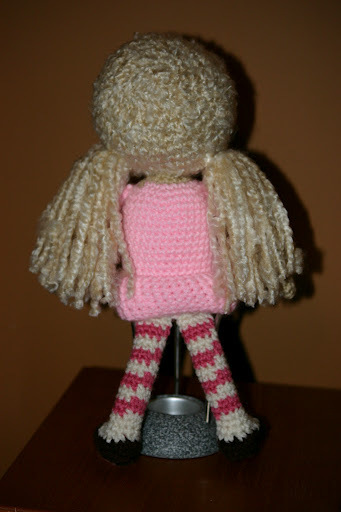 This entry was posted in first, Jiffy, Lion Brand, pattern, sock monkey, stress, writing on January 31, 2011 by littlebirddesignsfxbg. Phew! That was a long haul. 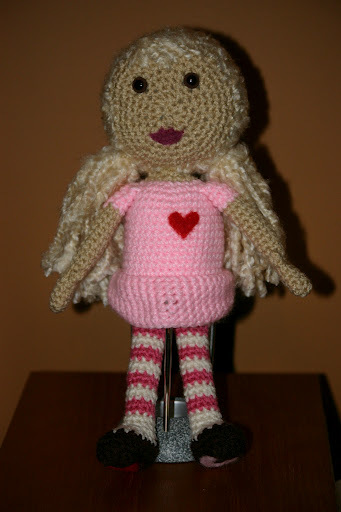 I was recently commissioned to make a 12″ crochet doll for a friend I used to work with. This is the finished product: A little tan baby girl in a pink short sleeve dress. She has on pink and white tights and little brown ballet slipper shoes. 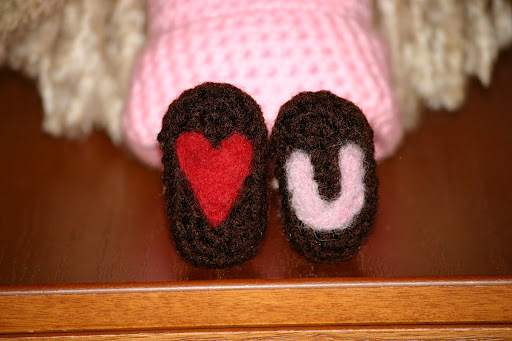 On the bottom I felted “love you” in pink and red. Little brown eyes and magenta lips. Cute sweeping bangs and loose pig tails. 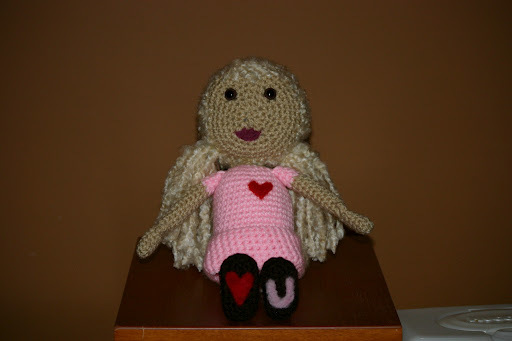 Super cute, thank you for the pattern Mamachee*Crochet makes me Happy! This entry was posted in girl, lips, magenta, pig tails, pink, shoes, slippers, tan, white on January 23, 2011 by littlebirddesignsfxbg. Within the next few days there will be a new “Birds Nest” wire crochet bracelet being listed on my Etsy shop. If you are interested, please check it out! This entry was posted in Uncategorized on January 18, 2011 by littlebirddesignsfxbg. In an ongoing effort to get my Etsy store up and running full time, all purchases and requests made via Facebook will now need to go through Etsy. Its really simple, just go to my Etsy store, click on the link to “Request a Custom Item”, and fill out the form. Then I will convo you with the price of the item and advise you an invoice via paypal will be coming. Pretty easy. Well guys, I’m a little late in saying this but HAPPY NEW YEAR! I know this is going to be a great year! It is starting off great and I hope the momentum continues! I’ve been busy with commissions and personal projects and have been loving every minute of it! I hope this New Year find you all happy, healthy and ready to enjoy another year here on this marvelous earth! This entry was posted in Uncategorized on January 8, 2011 by littlebirddesignsfxbg.